With the usual attitude of the IST – the Indian stretchable time, I reached the “Ubuntu Developer Day” or UDD for short, 10 minutes late, expecting the conference not to have begun. Contrary to my belief and to my surprise, the conference had already begun. It felt like there was a gun fire or something that indicated the start like in a track even in sports. As soon as I entered the Leela Kempinski hotel on my humble “two-wheeler” Unicorn, I was promptly stopped and redirected back out of the gate as the Leela gives parking only for cars and its employees’’ two-wheelers. The small side-lane played host to all us literally poor souls’ two-wheelers, where parking space is provided by our beloved BBMP. Once parked, I had to walk all the way back to the main gate again. After passing all my paraphernalia to the lady at the door, come to know that I had to use the other door which was behind the building and had to go through removing all my stuff off of me again for it to be X-Ray scanned. After entering the building and inquiring as to where UDD was taking place, I was redirected, again, to the previous building that I had tried to enter the first time. “WTF!” I thought. On getting my name and my employer’s name, the lady at the registration desk quickly found my ID that was already kept ready. She handed me the ID, the bright orange coloured, Ubuntu branded neck tag (which I liked very much) for it and also a copy of the agenda for the day. I had missed the Intro by now and was walking in to the second session by Jon Melamut – The Keynote address on Ubuntu and its future, followed by various other speakers which went on for the whole day. Talks went on about how Ubuntu promotes open source, how canonical actively pushes manufacturers to make their drivers open source, how open source helps third-world countries and a gentleman who runs Indiatechonline.com pointed out that Kerala is the first state government in India that has open source usage as a state policy. Some very good sessions followed on multi-touch and gesture recognition that is going to come in in the next versions viz. 11.04 and 11.10 and they had some neat demos of some multi-touch interfaces in the demo room. They had also this new piece of hardware created by marvel which packs a whole load of processing power into a brick sized device called a plug computer that runs on Ubuntu which attracted the most crowd in the demo room. The food at the Leela wasn’t to the expectations. There was a lot of variety but tasted worse than that of street vendors. Though there were a few items of our traditional cuisine that saved the day. Tea time and there were cutesy small Samosas and chocolate chip cookies which made a couple of boring sessions bearable. The worst part of this conference was that the organizers of such a big event had forgotten to get free Wi-Fi for the audience. I flipped open my netbook and boom – there were 4 hotspots, but on inquiring for the password found out that I had pay to use it. WTF! I thought - A reason for such a late blog about the event. Overall a great experience, although the food could’ve been better and it lacked Wi-Fi. Organizers take note. I don’t understand the point. The organizers spend so much on conducting an event of this scale and leave out a fairly basic feature of Wi-Fi which could’ve massively increased the visibility for the event. No internet access prevented people from live blogging/tweeting etc. which could’ve magnified the reach. The most satisfying part of attending this event, apart from interacting with some of the twitterati and getting to know what goes on behind the scenes in ubuntu’s development, was the goodie bag. 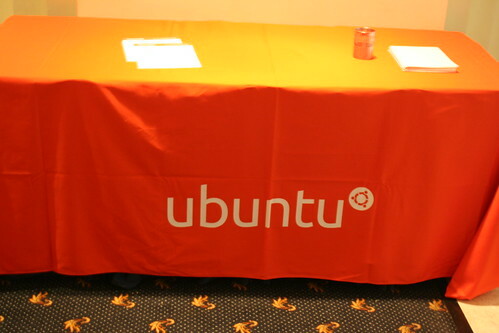 After the lunch, goodie bags were given out to every participant, again, brandished with Ubuntu’s logo. A cool looking cloth bag that contained brochures/fliers of “what, how and why Ubuntu”. An Ubuntu CD, surprisingly not the latest version. It was 10.04. Some cool Ubuntu stickers, which I asked for more and the lady at the registration desk, who initially said she had no extra, then somehow found one more just for me at the end of the day. That was cool. 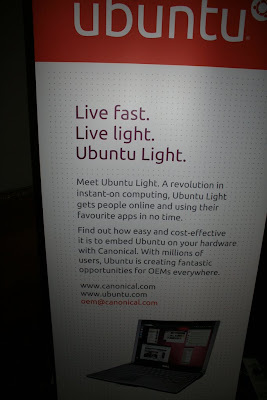 If you are that lady reading this blog – Thanks to you, I’m now flaunting the Ubuntu logo at insane places. A very nice looking diary, some pencils and the feedback form.